If you are looking for professional drum samples for your musical needs, you have arrived at the right place as we have been selling top-of-the-line drum sounds for over 10 years. At the moment we are offering two big packages, humbly called Ultimate Drum Samples and Absolute Drum Samples, both featuring a great variety of pristine quality drum sounds. While you can read about each package in detail (by clicking their corresponding links), here is a quick comparison to highlight the differences. The bottom line: Ultimate Drum Samples are recorded with better sound depth, feature more hits per variation (one variation means one type of hit executed on a specific drum/cymbal with specific technique and intensity/velocity/volume) and more variations (which translates to more subtlety in the final use) and include brush sticks techniques. However, the quality of Absolute Drum Samples is still fantastic and if you are after a greater variety of sounds, you should buy a bundle of BOTH DVDs as they feature completely different instruments, some of them very unique. With the included Sound Manager program (natively for Windows XP or better, Mac and Linux users can use Wine or Crossover to run it) you can easily play the available sounds, select those you would like to use and then export them to a specified folder. During the exporting process the sample may be assigned a new name using selected attributes, converted to desired format etc. After finishing the process, you can take samples from the export folder and use it as you wish, without any problems as they are named in a way that makes sense for your current needs. You can of course pick the sounds right from the DVD without using SoundManager. The sounds you wish to use need to be selected and placed in the list box in the right side of the windows. 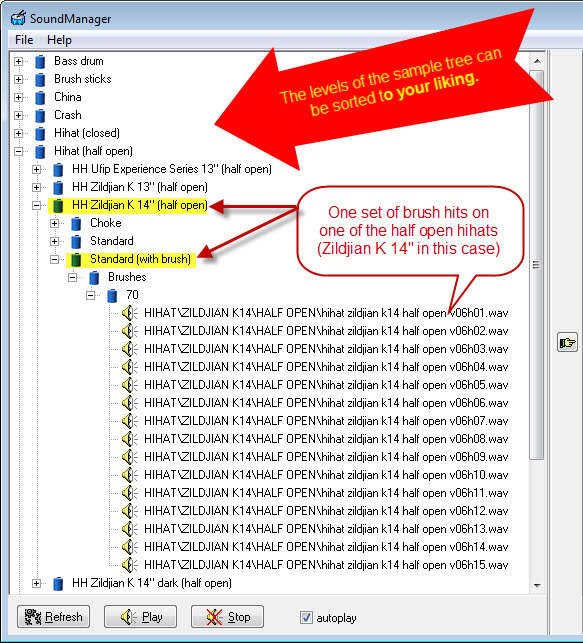 You can also copy and use the sounds directly from the DVD, according to the file path shown. The sounds are originally recorded in 24-bit 44100 Hz format and saved as 32-bit floating point WAV files (in Ultimate Drum Samples). If your specific application calls for 16-bit samples, you can easily convert them to this format by checking the appropriate checkbox.